Dutco Tennant LLC is a leading provider of raised access flooring and raised floor solutions in the entire Middle East and GCC region. We can help you provide raised flooring solutions that improve office environment for different commercial settings. A raised floor is a stage which is constructed several inches above the building floor, creating a space between the existing building floor and the raised floor. The main reason behind creating the cavity is to ensure that it is properly used for laying down building services such as power, voice, data, heating and cooling services. If the building services are laid down in this way, they can be easily accessed anytime for repairing, upgrading and redesigning your work space. 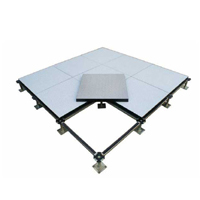 These raised access floor systems consist of bolt-together metal pedestals and floor plate of various materials. These false flooring and raised floor panels are completely modular, which means you can open any tile to access the cables beneath the false floor. The work done this way results in quick repairing and minimal downtime. The top false flooring can be carpet tile, vinyl tile, laminate or stone finished. These false flooring products and raised floor panels have been designed keeping in mind the continuously developing requirements of the new age work space. Such floors can effectively act in response to managerial and industrial changes rapidly and without difficulty, satisfy noise requirements, advance personal experience and add to the aesthetics of the building. If we think in log run, then also raised floor panels and access floor tiles are beneficial as they provide a long term money-making investment, and marvelous suppleness and capability in very less time. Office floors designed with these kinds of access floor tiles and raised floor materials are a perfect podium for doing your day to day business work. We are a raised floor materials supplier in the Middle East and Gulf region, such kinds of flooring systems reduces life cycle costs and is intended to meet the most challenging requirements of new or refurbished commercial buildings, providing you supple and high performance solutions. With our combined raised access flooring system, you can do make over of any place into a useful plus point. We are a renowned raised calcium sulphate core floor materials supplier, and provider of raised access flooring in Dubai. We have supplied a number of superior flooring solutions in the countries such as U.A.E., Qatar, and Saudi Arabia.